It's May and that means it's Lyme Disease Awareness Month. Although this may not be on your radar, it is certainly on mine and I could not let the month end without doing a PSA on Lyme Disease because, you know, I have it. outdoors, I swear to God. Now, let me tell you a little something about ticks. They don't care who your momma is or that she gave you that great hat with the lovely wide brim to protect you from the elements. If you have ticks in your element and ticks are attracted to you like they are attracted to me, they will find you. They will hunt you down, rappel from mountainsides, leap from trees, and crawl stealthily up your pant leg to find your super tasty sweet soft skin and make you their host. However, this is one dinner party you don't want to throw. Mainly because ticks carry Lyme Disease and you don't want it. 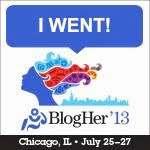 I've posted about it before when I was diagnosed here and unfortunately, it did not leave me. I still have it and am not sure if I will ever be rid of it. At least it's been manageable for me in the past year. That white speck is my skin. 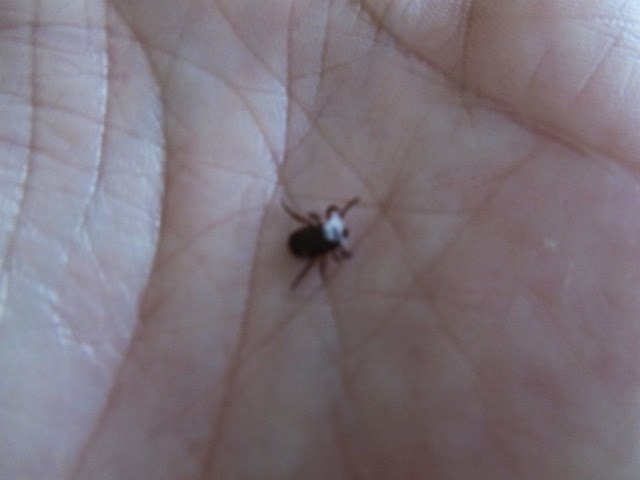 I've taken many pictures of the ticks I've pulled off in this past year. This year so far, I've had eight ticks attached and have literally pulled off about a hundred and that's no joke. Once again, bugs love me. I am their queen. To right, you will see a picture of a tick I pulled off my head. It still has a piece of my skin in its mouth. Although not a nice thing to think about, this is what you want to see. You want to pull off the entire tick and NOT leave the head of the tick embedded. Just ask Lisa Gradess-Weinstein, who after reading about my Lyme journey, recognized symptoms and went to the doctor only to find that part of a tick was left embedded in her leg, and causing her troubles. 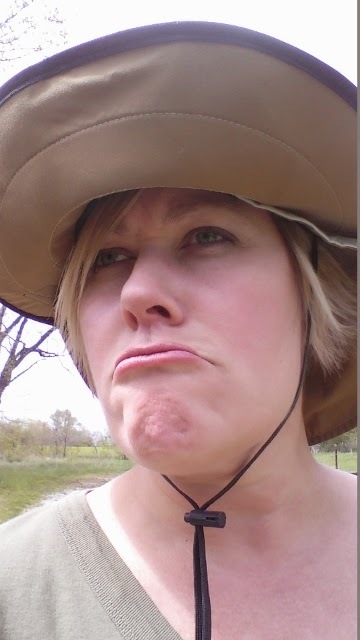 Thankfully, she was tested and did not have Lyme, but the bugger had left its troubles behind anyway. 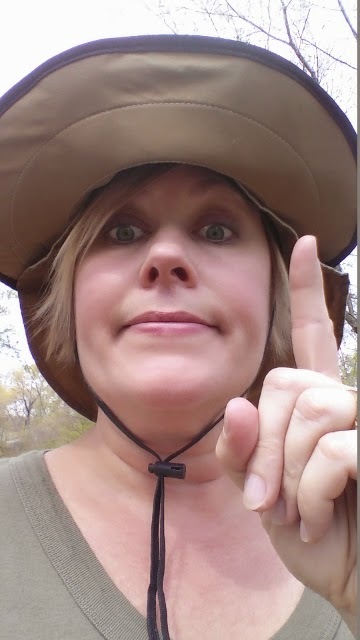 Ranger Cindy says "Protect and Check!" What can you do to protect yourself from getting Lyme Disease? Well, in honor of Lyme Disease Awareness Month, I am wanting to help spread the word, since I'm becoming quite the expert and all. Protect yourself with Permethrin if you are going out into the woods. I have dogs to walk and a trail I walk for exercise. I live smack dab in the middle of deep woods, so it's impossible for me to avoid woods and I would not advise that you let your fear overtake you and avoid woods for the rest of your life either. Nature is beautiful and should be experienced... with appropriate caution. I thought I would have to order Permethrin, but I was thrilled to find it at Rural King made by a company called Repel. You spray this on your clothing and shoes, backpack, etc. It not only repels ticks, but will kill them as well. Oh yeah, I totally did a kill test. These suckers are hard to kill, and this stuff works like a charm. Follow directions, though, because I think it lasts two weeks or something like that and I have found it to produce great results with one application to shoes and pants - many days tick free! You can also use repellents like Off or Cutter. They don't keep everything off of me, but they do help. You may smell like a chemical factory (see pictured stinky face), but you won't care if it keeps you from getting Lyme Disease, trust me. You don't want it. Ever. The next thing you do to protect yourself is to check, check, check yourself for ticks after you have been in an exposed area. This week, I had someone who lives in town tell me they found a tick on their pillow at home. They have no idea how it got there. So you never know, but you can be sure that if you have been in a wooded area, they may travel home with you or on you or with your dog or on your dog. Check especially under areas where your clothing may have been tight. The tick I had which transferred to me the evil Lyme Disease was under my bra strap to the back of my armpit. Stealthy and unnoticed, it did its thing for two days before I discovered it. Ticks come in several shapes and sizes, so look at the pictures here and on other websites to familiarize yourself with what they look like. They can be oval or round, brown or black, white dots or solid color. They love to attach to your head, so be vigilant to check your hair very well with your fingertips and fingernails after a walk in the woods. Check again after several hours. Check again the next day. And for good measure, the day after that. You can never be too careful and they can attach without you ever feeling it or knowing it. The one pictured below is on a postcard. That's a postal bar code there, for size reference. They can be so small, you can barely see them. Once, we went mushroom hunting in Tennessee on the way to vacation in Alabama and we came back to the hotel room only to find that we were all covered in tiny ticks. We must have stumbled into an area with a nest or infestation. We found lots of great mushrooms, but we were panicked about all of the ticks. We had to check in crevices of each others' bodies that nobody ever wants to see. Still, with showering and closely inspecting, we all still had ticks attach. Some ticks are as small as a speck of pepper, like the next pictured one here on top of a contact lens solution bottle cap. I'm using a magnifying glass in this particular photo and there is a hair beside the tick to show the size. It was so tiny, I was lucky to detect it. 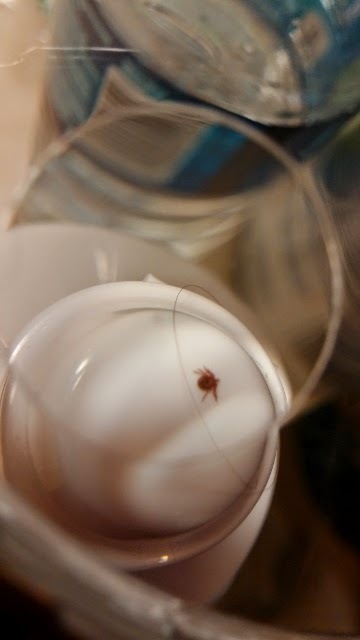 I mostly get ticks when I've been outdoors unprotected, but I sometimes find them in my house just crawling around. I recently found two beer ticks in the house. Yep, you heard me right. I said beer ticks. I have photographic proof. 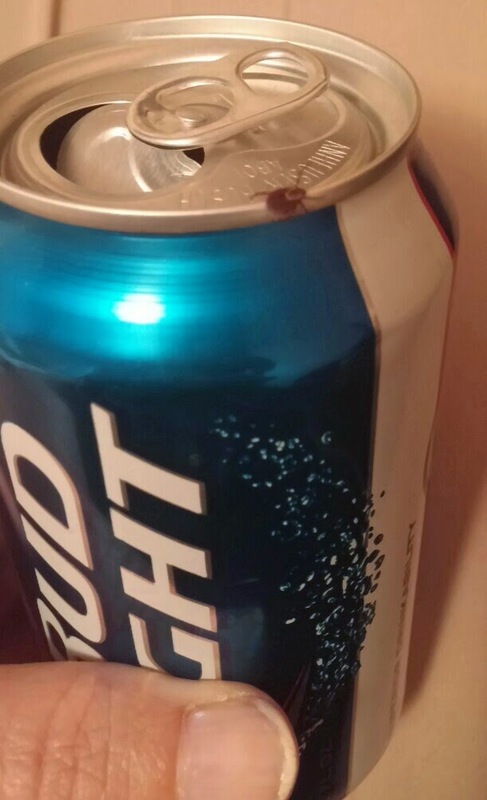 I found ticks in my house on not only one, but two beer cans one day. 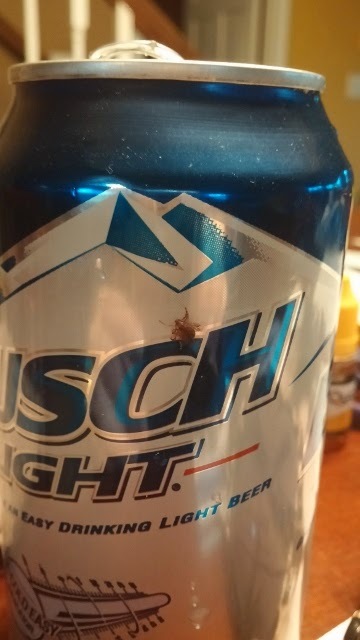 Apparently, beer ticks prefer light beer. When ticks attach, they excrete a kind of glue which helps them adhere to your body. You can react to this substance and it can make you itch as well. I saw a piece Dr. Oz did on ticks and I had to cringe. He instructed the woman on stage with the giant pair of prop tweezers to remove the giant prop tick and he told her to grab it behind it's head. WHAT? No, no, no. You should use tweezers if possible (especially if you have someone else to help you remove the tick), but you have to be careful not to squeeze the body of the tick and squeeze its Lyme juice right into you. You want to make sure you remove the head of the tick, not leave it in your head. As I mentioned before, if you see a speck of your own skin in the tick's grasp when you pull it out, that's good. It means you removed the entire tick, head and all. 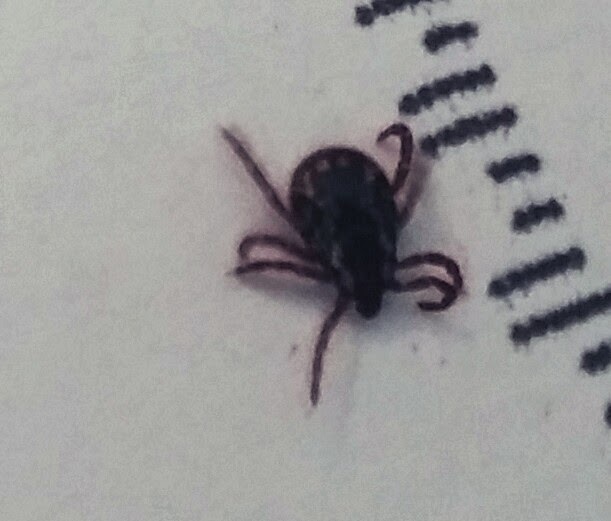 When I found the tick with the horrible cellulitis-like swelling (which in reality was the Erythema-Migrans rash, cleverly disguised as cellulitis and not really a bulls eye looking thing at all), my doctor treated me with antibiotics that should have taken care of an initial Lyme Disease infection, but it did not. Perhaps it was too strong. Perhaps I was too weak. Perhaps my theory is right and I already had Lyme Disease which had not been too problematic in my life and that particular tick bite kicked it into overdrive. If that theory is correct, then I was already in late disseminated Lyme and the antibiotic treatment I received was not adequate. After being sent to an Infectious Disease Specialist and being put on two months of Doxycyclene (which he said "should take care of it"), I still can tell a year later that I am not rid of this disease. I have started my Salt/Vitamin C regimen again. I have good days and bad days, but it is nowhere as bad as it was before. I have that weird feeling in the back of my head. My arms fall asleep at night. My right elbow and my forearms feel arthritic. I'm seeing the rashes reappear. I just know what it feels like. I know what it feels like to the point that I helped diagnose someone recently. I ran into my sister-in-law's mother at HellMart Walmart and she told me she felt like she was falling apart. All of her symptoms were so similar to my late disseminated Lyme symptoms that I made her promise that she would demand her doctor test her for Lyme. She did. She was positive. Then, she went through the same rigmarole many Lyme sufferers experience. She had several other docs say, "Nope, you don't have it." I urged her to find an LLMD. She persisted and was properly tested and guess what... she has a bad case of late disseminated Lyme. Not only that, she had been diagnosed and treated for MS for 18 years and the LLMD said, "You never had MS. This has been Lyme the whole time." Imagine! She is now in the fight of her life, taking eleven medications and thankfully covered by insurance thus far. I know like I know like I know that there are thousands of people out there just like her, misdiagnosed with illnesses like Fibromyalgia, MS, Chronic Fatigue, etc. Lyme is not nicknamed "The Great Imitator" for nothing. It mimics many diseases and doctors are sorely under-educated about Lyme. Do what you can to help spread the word and just be aware and protect and check yourself when outdoors. If someone has the symptoms I listed in my first post about Lyme (reference the link at the beginning of this post), please encourage them to get tested and seek the advice of an LLMD. 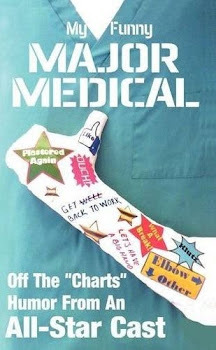 An LLMD is a Lyme Literate Medical Doctor and is NOT an Infectious Disease doctor or a regular MD. It is someone who specializes in the treatment of Lyme Disease. Be safe and enjoy the summer! Back to more fun posts in the future which will not feature creepy-crawlies, I promise. Thank you for the informative post, presented with a light touch as always, Cindy. I appreciate you helping me to be more tick-aware. Also, you look adorable in that hat. Great information Cindy! And you look adorable in the hat! I got my tick bite while riding my bike, it wasn't even in a wooded area! 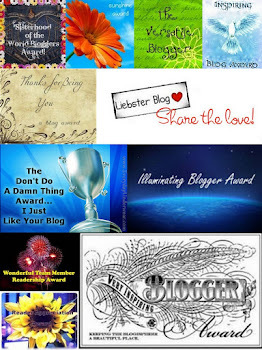 Hiya Cindy - I've run across another blogger whose husband has just been diagnosed with Lyme Disease. I'm going to pass along your site info - she might like to read what you've got here . . .
Lisa, I think ticks are going to become a problem for everyone everywhere. They're taking over the world! Well, okay, maybe not, but I do think they're getting to be a horrible problem. Hopefully the medical community catches up. Where you are, treatment is good because it's so common. Here, they have no idea what they're dealing with and almost all of us end up with late stage due to misdiagnosis. P.S. 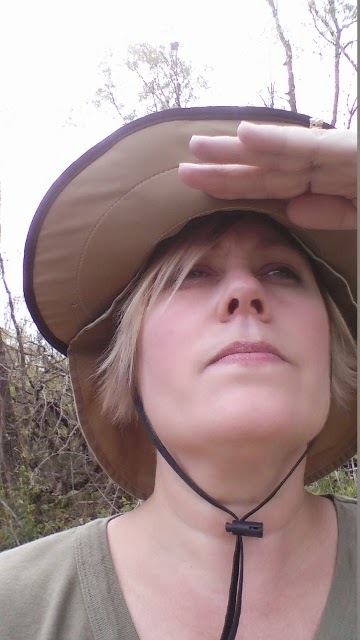 My 13 year old loves that hat and has stolen it from me to wear to the beach. She says they're really in right now. Who knew? I couldn't believe it! I always love to see you, Cara! Thanks for the compliment. 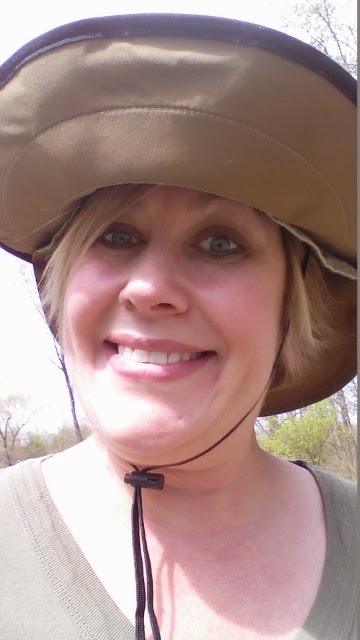 I couldn't resist doing a Ranger Cindy post when I saw the hat ;0) And yes, please be aware of ticks. You don't want this awful disease if you can avoid it.